Question for all of us: Did the weakening the Colombian Peso in 2014 save Doris’s job at Crystal filling Jockey contracts? We hope so, but we have to check the real exchange rate at the USDA ERS or at the BIS (the IMF?) This version of Industry Follows Poverty includes an interactive documentary, again start with “You” but do watch all segments, including the separate “Giant Book” episode below. Note the group exercise of the workers in Medellin, why are they doing this? Be prepared to look away or skip the Rana Plaza photos, shocking and too much like the office building that just collapsed in Mexico City… horrible. Not also the machinery that makes the yarn, where do most of these machines come from? 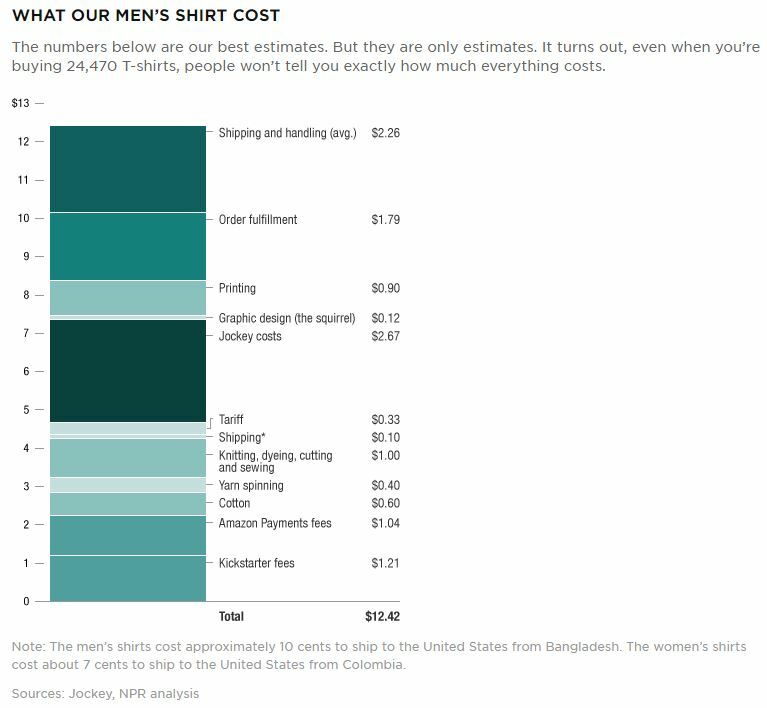 Note the value chain for the men’s tee-shirt in the “boxes” espisode: they charged $25 each, but the “you” customers look very happy, the total cost of the tee-shirts, $12.42 for the men’s shirt, left a lot of profit (it paid for these videos). An amazingly good job… very well done NPR Planet money… There are of course “American first” issues here. The U.S. produces the extremely low cost cotton, few jobs however, and you can see once you have the seeds, cotton is almost completely grown and harvest and spun into yarn but machines. Shipping costs are very low to containerization (type in the Ship’s name, Hansa Kirkenes, German owned I think, and you find where it is now). Containers and huge ships have driven down shipping costs, what happened to all the workers (“long shoremen”) that used to load and unload ships (mechanizatio took their jobs…). Try to break the men’s shirt valued added into who gets what, do we find a smiley curve (perhaps not, this is Planet Money tee-shirt). Will Colombia keep its toe hold in the U.S. market (contracts with Jockey)? How does a free trade agreement help Colombia? Is this fair? What else could explain the Medellin factory? How might the Pacific Alliance affect Crystal? What can the government do to keep these factories open. Note that we visit Doris Restrepo’s house, however the text introduces “Noreli Morales, a Colombian worker who helped make our women’s T-shirt, lives with her mom and her daughter in an apartment that has a kitchen and a bathroom.” She is on the right in the picture. She lives with her daughter and mother… depending on her age she may well have access to Colombia’s excellent condition cash transfer program (look up the name). If Doris is laid off, she would likely move into the informal sector, doing what? Factory jobs created social mobility, especially for young women and children. ***Colombia is a very interesting case study of poverty reduction and economic development, starting with the end of long and violent conflict. This case study focuses on post-conflict poverty reduction, particularly reintegration of groups formerly at war (in this case the FARC). Wracked by violence and long war, Colombia’s President Santos recently signed a peace agreement with FARC. Pope Francis and the UN are now helping Colombia integrate the opposing army into Colombia society. President Santos was awarded the 2016 noble peace prize, just before his first peace plan was rejected by voters. Fortunately, he and the FARC pushed ahead anyway, ignoring calls to exclude or further punish the FARC fighters and leaders (in contrast to lustration policies pursued by Iraq, Sri Lanka and Ukraine). How the FARC integration process works will take years to assess, the focus of this case study is role of international policies and players in shaping Colombia’s recent growth, in particular how has trade and globalization (Colombia is part of the Pacific Alliance) in reducing poverty and inequality, what has been the role of international institutions and countries in helping Colombia end conflict and redirect its economy to legal exports. 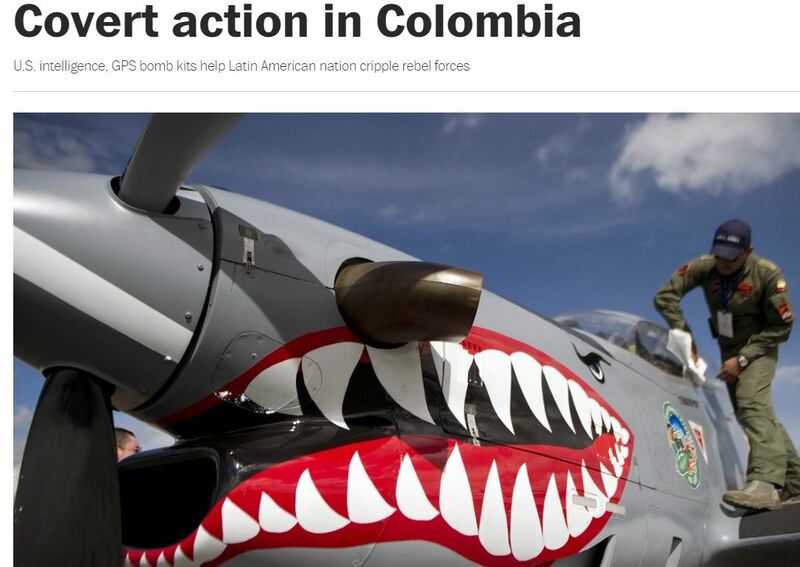 What was the role of the U.S. in particular in helping Colombia end violent conflict. This is important because today Central America and Mexico face some of the same problems of violence many blame on drug traffickers. Can Mexico and the Northern Triangle countries follow Colombia path to reducing violence? 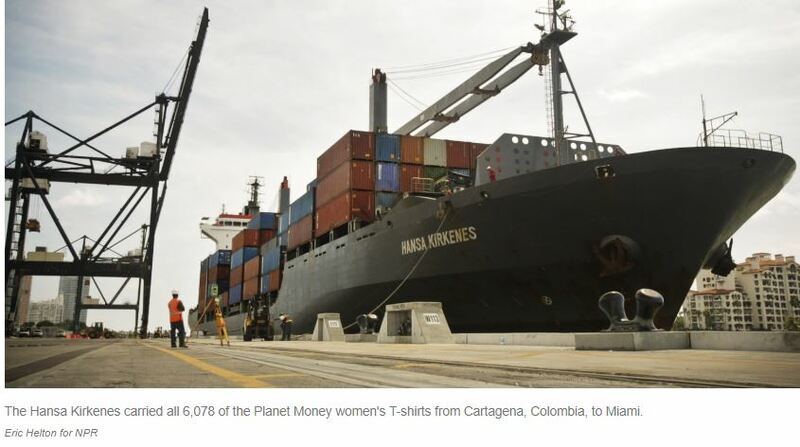 Coincidentally Medellin Colombia, base of the famed Medellin cartel, is where Jockey purchased it’s shirt for women, as featured in the Planet Money special (Doris Restrepo and Noreli Morales work in this factory, Doris speaks in the “you” episode a good place to start…). 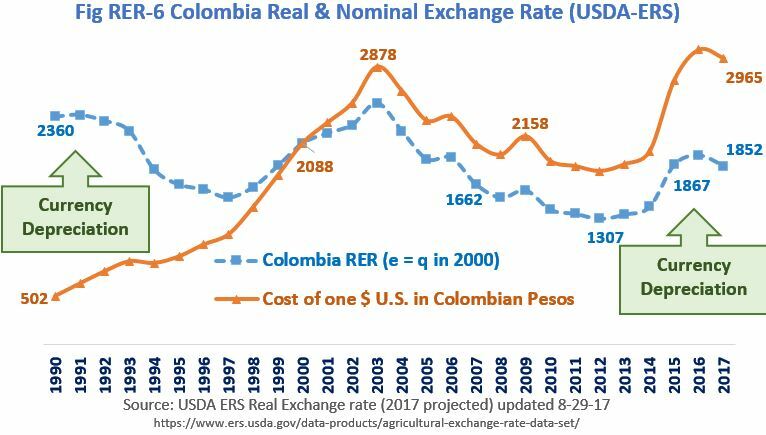 Unfortunately, despite a useful free trade agreement with the U.S., this industry may be threatened by Colombia’s strong real exchange rate (is Crystal the company Doris worked for still operating in Medellin or Cartagena? ).